CONTAINEX projects can be found all over the U.K and Ireland, from Lifeboat Stations in Scotland to Site Offices in the heart of London! View our reference projects and find out more today! The applications of our mobile modular buildings are very diverse and can be found in the sectors of trade, industry, local authority, events and disaster relief. Depending on the project, you can create different sized modular buildings with different equipment variants. Our modular buildings consist of at least two mobile space modules that you can combine as required. Thanks to the flexibility of our panel system, you have the opportunity to create modular buildings with up to three storeys in various sizes or configurations. Here you will find several configuration examples. Supplementary container types include terrace containers, corridor containers, internal staircase containers and external staircase containers. Find out more about this special container types here. For our modular buildings, extensive equipment options are available for the indoor and outdoor area. In order to perfectly integrate your modular building in its surroundings, all colours on the CTX-RAL chart are available. In addition, you can round off the unique appearance of your modular building with a canopy or a fascia. In the case of a two-storey building you can integrate an internal staircase as well as an external staircase. 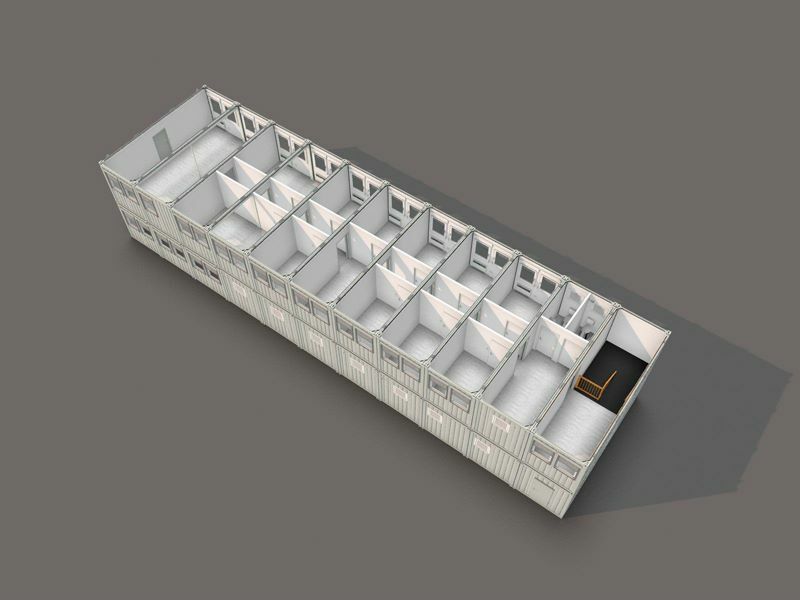 As part of the individual planning for your mobile modular building, you have the opportunity to choose between various options for the interior fittings. This begins with choosing e.g. interior decor, floor covers, lighting systems to energy-saving options and security fittings. 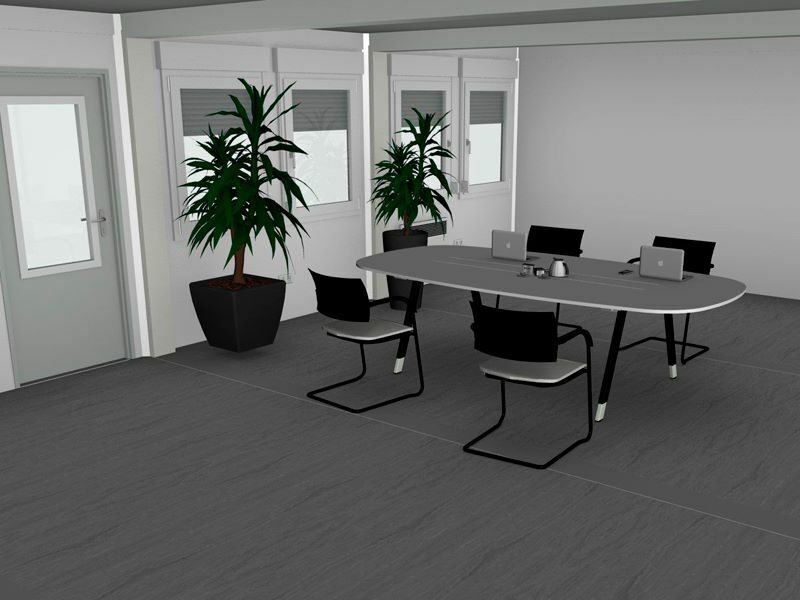 Due to the different full glazing variants, you can quickly and individually transform your modular building into a modern showroom. To increase the safety of your employees in the modular building, we have developed the flexible fire protection systems. With quick installation, thanks to pre-assembled fire rated components, you achieve the highest fire resistance classes (REI 30 - REI 90). With further options e.g. window/door grille, your modular building is protected against unauthorised entry. Due to the various thermal insulation variants MW (mineral wool), PU (polyurethane), PIR (polyisocyanurate) or SW (rock wool) and the air-conditioning options, you can achieve a perfect indoor climate in your modular building. Supplementary container types include room modules which can either be used individually (terrace container) or in combination with a modular building (corridor containers, external and internal staircase containers). You can assemble our terrace containers as an individual unit or integrate them perfectly into a modular building. The visually appealing and robust design of the terrace container thus creates an additional recreational space for you or your employees. There are two designs to choose from: terrace containers with or without a roof. Both variants have a high-quality terrace floor made of WPC slats. The colour of the paint can be selected individually from the CTX-RAL chart. 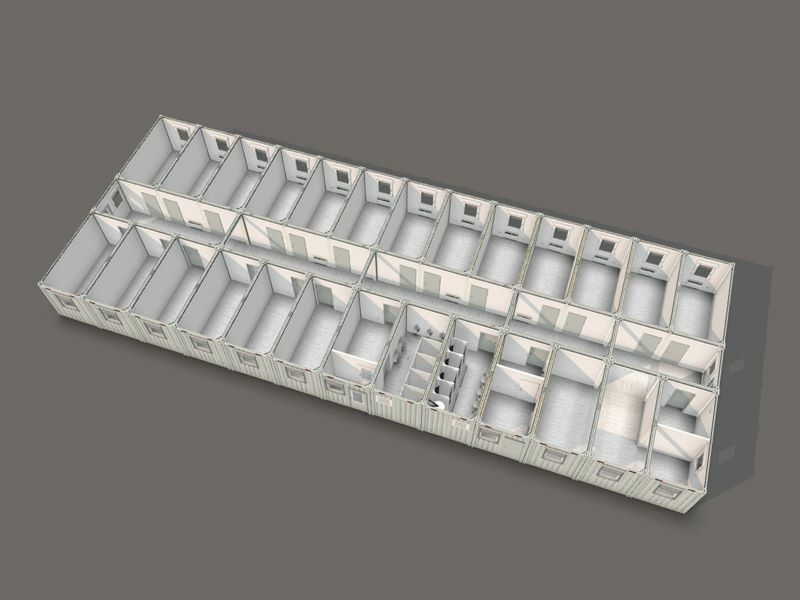 You can optimally integrate the corridor cabin into a modular building. This is used to connect different space modules and thus gives your building the right structure. The external staircase container can only be integrated into a 2- or 3-storey modular building. This container type can be used in addition to or instead of an internal staircase container. External staircase containers can also be easily adapted in retrospect and provide a safe way to move between floors in every season.